Here we will list the many advantages real-time analytics can offer your business and the massive impact it can have on your bottom line. 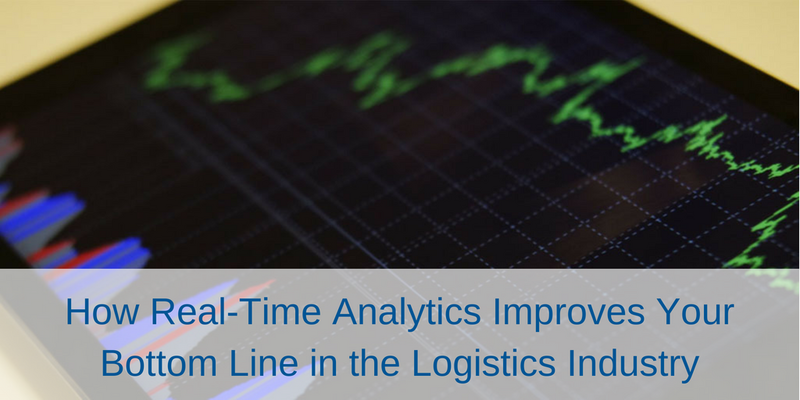 Real-time analytics play a crucial role in increasing the efficiency of drivers’ routes. Dispatchers are able to analyze the best routes for the drivers to follow, decreasing travel time and amount of fuel used. If an unforeseen obstacle arises, such as construction or an accident, various routes are analyzed to see which ones would offer the next best ETA. When an organization signs on for loads they did not previously have, they are able to analyze which driver’s route can be adapted in the most efficient manner to pick up the load without wasting miles. Maximizing loaded miles and eliminating deadhead create optimized routes that have great margins. Eliminating manual dispatching improves fleet efficiency, reducing detention time and expenses among other benefits. With more efficient routes comes fewer resources wasted. Fuel consumption drops dramatically when unnecessary miles are not traveled. As we’ve covered before, fuel is by far the highest operating cost of trucking companies, so any amount that can be saved is great for profits and the environment. Fewer miles traveled also means less wear and tear on trucks and equipment. Analytics can act as a sort of preventative maintenance tool that prolongs the life of your assets. Analytics don’t apply exclusively to routes -- they can also be utilized to streamline internal operations. In the same way drivers can be monitored in real-time on the road, available hours can be evaluated -- allowing the correct number of drivers to be scheduled every time rather than trying to make an educated guess. Preserving resources quickly adds up to large savings -- less fuel used, longer life of tires, brake pads, clutch, etc., and fewer drivers and staff are just a few of the resources that can be conserved. Real-time analytics allows organizations to make informed, data-backed decisions on the fly. Being able to analyze all aspects of your operation can narrow or completely eliminate efficiency gaps you may not even be aware of. If an organization does not use real-time analytics, an opportunity could pass them by that wasn’t identified in time. Rather than waiting on data to be gathered and analyzed, real-time analytics allows organizations to have instant insights on their organization, leading to an immediate impact. For example, if a potential customer contacts your company in need of immediate service because their previous provider backed out, you are able to look at where your drivers are located at that exact moment and calculate if you will be able to handle the job. Because of the visibility of all aspects of your operation, you are able to get more business and be the hero for that company -- a great basis for business down the line. Without real-time analytics, you would have to make estimates that are not guaranteed and could end up doing a sub-par job. All of the advantages above have one thing in common: they increase your margins. High margins are vital in the trucking industry, so finding an edge to increase them is a huge win. Real-time analytics and advanced technology is an investment in your company’s future -- and you’ll see it paying dividends very quickly down the road. Real-time analytics is just one of the tools and strategies mentioned in The Agile Fleet Playbook. Download it today and see the others, along with problems the trucking industry is facing and research predicting future trends.